Sandwiched between North and South America and two oceans, Costa Rica is an amazing bridge of biodiversity bursting with natural wonders. For such a small country, it is home to more than 500,000 species; 250 of which are mammals. 1. The Central American Agouti is a large rodent, kind of like a hamster on steroids, which feeds mainly on fruits and seeds. You can see them roaming the forest foraging during the day. Agoutis have a keen nose and sharp hearing, and make a high pitched noise when frightened. 2. The Tayra, known as a â€œtolomucoâ€ in Costa Rica, is in the weasel family. Most tayras have either dark brown or black fur with a lighter patch on its chest. Tayras eat mainly rodents, but also fruits, honey, reptiles and birds. They live in hollow trees, underground burrows or nests in tall grass. 3. Also called a coatimundi, the White-nosed Coati is a long-nosed brother of the raccoon. They are omnivores, preferring small vertebrates, insects, eggs, and fruits like bananas and papayas. They can climb trees easily and use their tail for balance, but usually they are on the ground. 4. 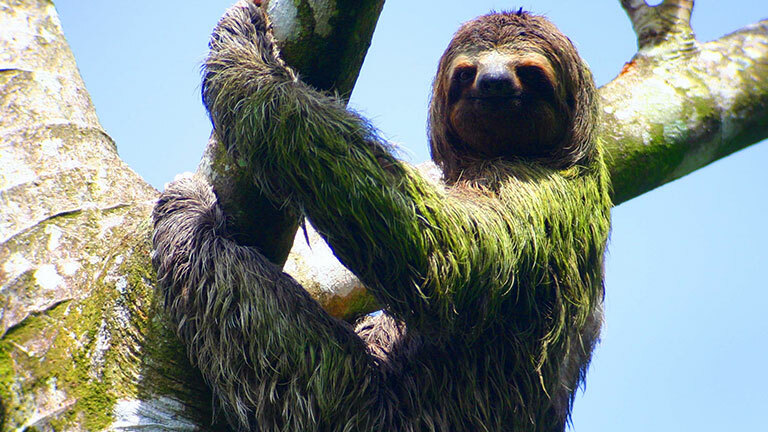 Sloths are known for being incredibly slow; sloths sleep 16 to 18 hours a day and live high in the tree canopy, coming down only once a week or so to relieve body waste. Although slow in the trees and walking, they are actually strong swimmers. They eat mostly buds, tender shoots and leaves, mainly of Cecropia trees. You can see both the Three-toed sloth and the Two-toed sloth at Playa Nicuesa. 5. The Northern Tamandua is a medium-sized anteater with a prehensile tail that can latch onto tree trunks and branches. Its fur is pale yellow over most of the body, with a distinctive â€œvestâ€ of black fur. Living mostly in the trees, its tongue is long and covered in sticky saliva able to pick up ants and termites â€" these animals might eat up to 9,000 insects in one day. Northern Tamanduas are mainly nocturnal. See these animals and much more at Playa Nicuesa Rainforest Lodge on their 165-acre private reserve bordering the Piedras Blancas National Park at Golfo Dulce. The eco-lodge is a great place for travelers interested in ecotourism, nature and adventure. For the best wildlife viewing, go on a guided hike on the lodgeâ€™s trails in the early morning or just before sunset.